Quality Print in Lancaster Centre. Posters, booklets, leaflets, brochures, business cards, fine canvas, invites, plans printed. Fast turnaround quality print. Posters printed same day, any size required. 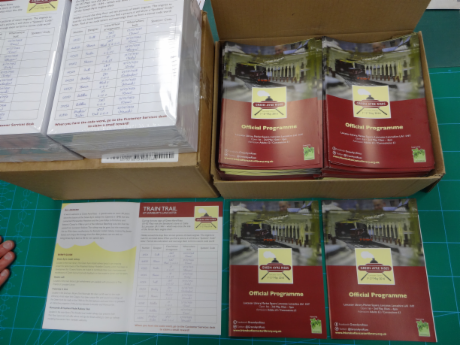 Booklets, brochures, leaflets, postcards, flyers, invites printed. Foamex & Correx signs supplied. Wire, comb & soft binding service. Roller banners, Banners & Ink stamps supplied. Lancaster, Morecambe & surrounding areas. Cash, Visa debit, Credit card, Cheque, Paypal. We definitely are the Printshop & definitely not a cafe ! Lancaster council have conveniently stolen our business name. We are nothing to do with The Storey. Obviously Lancaster council do not encourage local independent business, they wreck it. Its great how they have ruined my search rankings, very well done, good work. We are located above William Hill the bookmakers, our entrance is on Russell St, the same as Urban Attic, opposite the rear doors from Wetherspoons. Walk past Mark Leigh turn right or Koko turn left, then you are on Russell St, look for A-boards either side of the door with stairs painted on them, open the door & walk up the stairs for lots of lovely printing. Printroom Lancaster is located on Common Garden Street & is an Independent print business. We provide helpful quality print services. Business cards to A0 posters printed & all sizes between. Everything printed here apart from larger quantities, we then use our quality supplier with a 2 day turnaround. Ink Stamps, Banners & Roller Banners supplied.